The Mountsorrel & Rothley Community Heritage Centre and Mountsorrel station are both new-build. Access for less-able visitors has been a major consideration during their planning. To assist you in getting the best access to the Heritage Centre, stations and trains we have detailed below what you may expect from your visit and possible restrictions. Parking your car: Accessing the site. For blue-badge holders designated disabled parking spaces exist at both the Heritage Centre and Mountsorrel station. There is level access to the Heritage Centre and associated Granite’s coffee shop at Nunckley Hill. However, to get to the trains, railway museum and exhibition building, you will need to descend down a bank. With this in mind paths have been incorporated into the design that have wheelchair friendly gradients and level rest areas. These paths are of concrete and should give a good surface for wheelchair users. Every care has been taken to make the centre as accessible as possible. Exhibitions are over two floors, the lower floor is on the level and the upper floor is accessible via a lift. The Heritage Centre is accessible not only for those who are in wheelchairs, but also those with sight, hearing, learning and other physical difficulties. The Heritage Centre has a “Quiet Room” on the first floor accessible by lift, for the use of visitors who, through illness, infirmity or disability, find it difficult to have a day out because it can be over-tiring. Our aim is to provide a comfortable room where these visitors can go to rest or administer their medication. The Centre will not be providing medical facilities. Granite’s coffee shop has wheelchair-friendly access. Tables are intended for use by all wheelchair users but this may not be possible for some larger, non-standard wheelchairs. If you encounter a problem, our friendly staff will make every effort to ensure you are looked after. Several of the tables on the patio have been modified to accept wheelchairs. This is a half-mile path which passes by many ecologically interesting areas. Visually impaired visitors will find shorter messages in Braille at the bottom right-hand corner of the notice boards. There are tapping logs at the side of the path along the whole length of the trail. 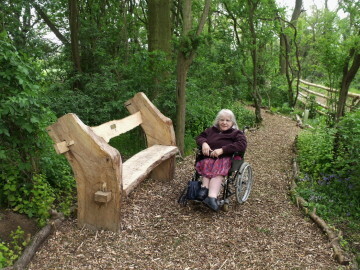 The nature trail is wood bark chippings and is not an ideal surface for an independent wheelchair user to push on. We recommend that have an assistant to help them with this surface. 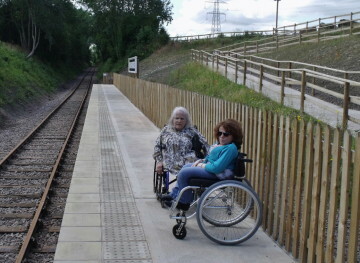 Trains carry a portable ramp for use at both stations for safe access by wheelchair. If the stations are unstaffed, assistance should be sought from the train staff. Some trains have specific less-able accommodation, but not all. It is advised that a call to the Great Central Railway (01509 632323) should be made to enquire whether trains operating that day carry this facility. Ambulant disabled people should be able to access the rest of the train via ramped wheelchair access into the guards van. The heritage railway carriages have narrow aisles and corridors, so wheelchair access is not possible along the train. If you are planning a trip along the line visit the GCR website to see details of any upcoming events. Disabled toilets can be found at the Heritage Centre. There are no toilet facilities at Mountsorrel station. There are no disabled toilet facilities on the branch line trains. Please take care when on or around our stations. The platform edge is picked out by a white line and there are tactile surfaces on the platforms. Station staff will be happy to assist if needed. We will be happy to accommodate parties of less-able visitors, but advance notice will be necessary to arrange parking and access. Please contact the Heritage Centre to initiate the necessary arrangements. We want to assist in any way we can to make your visit enjoyable.